It was February 2015 and I'd just returned from Southern California where I'd run a Spartan Trifecta over two weekends with some amazing new friends from the Weeple Army (a bunch of obstacle crazy folks based in California). I was chatting on Facebook to my friend Kirsty about the Hawaii Trifecta Weekend in August and I started to wonder whether it was possible to squeeze more trifectas in from some other countries. That's when my inner OCR nerd took over and I created a calendar with every single Spartan Race from around the world on it, and soon I saw the perfect opportunity to do overseas trifectas. My crazy idea was born and was given the nickname 'Round The World Spartan'. The idea was to run eight Spartan Races over three weekends in three different countries during October, starting in Lake Tahoe at the Spartan Race World Championships. The following weekend would involve a Trifecta in Barcelona (Spain), and finish with a Trifecta in Marseille (France). A few weeks later the flights were booked and the' top secret' planning was underway. In June, I received an unexpected email that changed my life for the better. I received an invitation to compete as part of Team Australia at the OCR World Championships in Cincinnati (Ohio). The only thing was that the weekend of the OCRWC was the same weekend that I was meant to be in Marseille running a trifecta. Opportunities like this don't come up every day, so I jumped at the chance to represent my country! I made the necessary flight changes and had another massive but awesome secret to keep. Soon it was September and the RTWS trip was almost upon us. I was nervous and excited and ready to run! Part 1 - Spartan Race World Championships - 3/4 October - Lake Tahoe, California, USA. I knew that a lot of my US based friends would be heading to Tahoe so when I saw them in Hawaii back in August, I made a deal of saying a sad goodbye and pretending that I wouldn't see them until 2016. I made sure that I stayed away from Facebook and Instagram for the few days that I was in transit and in Tahoe to ensure that nobody knew I was there. I was set to tackle the Beast on the Saturday, and would be running the Charity Sprint on the Sunday with the Weeples. I'd spent the last three months in Australia, doing altitude training to help my body prepare for the lack of oxygen in Tahoe as the race would take us to an altitude of almost 9000 feet. Mentally I was ready, but a stomach bug got the better of me the night before race day and I lost all my nutrition and hydration. But I wasn't going to let that stop me. I arrived at the race site on the Saturday morning for the Beast and took a moment to appreciate the beauty of the mountains that surrounded me. The weather was a warm -1 degree, but at least the sun was shining and the wind was calm. I picked up my packet and walked to the Weeple tent and was met by shrieks and a mass of hugs as my friends realised that I was there to surprise them! I said a quick hello to everyone and got ready to race. The atmosphere at the start chute was electric. My 500 fellow Spartans and I were ready to take on what was set to be one of the more challenging Beasts (thanks Norm), not just because of the terrain but because of the altitude. We found ourselves immediately in waist deep water and then started the first of many hill climbs. The terrain was easy at first but got tougher as we climbed (hello inner mountain goat), particularly due to the amount of rocks and single tracks. The obstacles weren't overly hard and I found the terrain to be the most challenging part. The altitude didn't affect me at all thanks to all my training. The climb to the very top of the mountain was tiring but the view was incredible! The two most exhausting obstacles were the log carry and the bucket carry, and the chill factor after a cold swim really tested all of us. The bucket carry on the Sunday was a lot easier, and thanks to Joe De Sena (Spartan creator) I had a few extra rocks in my bucket by the end. It was an awesome but tough weekend and one of the highlights had to be handing out unsuspecting Americans, Vegemite chocolate post-race and the fact that most of them actually liking it ;-P luckily I had a few days to relax post-race before it was off to Barcelona. After Tahoe, I figured the Barcelona races would be a 'walk in the park'. The plan was to complete a Beast/Sprint combo on the Saturday and the Super on the Sunday. I was excited but a bit drained from the travelling and figured that six hours to do a Beast would be plenty of time, after all I did Hawaii in just over six hours and walked most of it. My strategy was to walk up hills and run everything else, however, this was quickly challenged when I saw the terrain. In Tahoe, I kept commenting that I was channeling my inner mountain goat as we had to traverse many rocks, but that terrain had nothing on Barcelona! I tried to run as much as I could, however, the sandy and rocky terrain proved to be difficult and I was worried about tripping or rolling an ankle. The hills seemed to be never ending, and just when you thought you were at the top another section would appear! I got to a heavy chain carry at the 18km mark and knew I'd have to dig deep to get up yet another sandy hill. The chain would've been about 20-25kg and was mentally and physically draining to do so far into a race. After the chain carry I had to start running like crazy as I was almost at my six hour limit and I needed to get back to the start line for the last Sprint wave. Luckily I made it back with two minutes to spare. I was dead last in the Sprint and two Spartan staff who were sweeping the course started chatting with me to keep me going. I kept trudging along and eventually caught up to the people on the Beast course, which meant I was close to the finish. When I crossed that finish line I broke down in tears as I was so relieved to have finished. The Super on Sunday was very 'cruisy' indeed as we were all hurting by then, but we got it done. One of the biggest challenges was trying to complete obstacles whilst covered head to toe in epic amounts of mud. I must say that this course made me the muddiest I've ever been in an OCR! I even had to shower with my medals on the Saturday as they were filthy! I picked up my 5x Trifecta medal on the Sunday was was pretty stoked with my achievements, but I knew the toughest was yet to come. I flew into Cincinnati from Paris on Wednesday and had a few days to prepare myself for my toughest physical and mental challenge ever. I met up with the other Team Australia athletes on the Thursday and we helped out with the course build, and then with registrations on the Friday. Seeing some of the obstacles helped put my mind at ease, but I was still extremely nervous going into the Saturday. 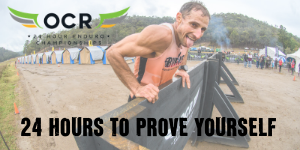 The OCRWC works differently to other OCRs - you get a wristband at the start of the race and if you choose not to complete any obstacle it will be cut off. This means you're not eligible for prize money, and any other obstacle that you choose not to complete will result in a time penalty. You do however have a chance to re-try the obstacle as many times as you want. No burpees out here! I wanted to keep that wristband for as long as I could and was determined to see how far I could get. I arrived at the race site and it was a warm 0 degrees and quite windy. I was trying to prepare myself mentally for the race but all I could think of was how cold my toes and fingers were. As I entered the start chute I saw that there were only about 50 elite women, and at that moment I was so proud to be standing alongside the best in the world that I forgot about the cold and prepared for the adrenaline surge. The starting gun went off and I started running. I knew there was no point in trying to keep up as these women were fast, so I just paced myself and reassured myself that I was running my own race. At about the 1km mark I started struggling mentally as I was cold and was letting the outside world affect my performance. I got to the first obstacle (5 foot walls) and saw Deanna Blegg on the sidelines. She asked if I had any Tim Tams (I gave her one in Tahoe) and I said I had Vegemite so I was ready for the day. I had a bit of a laugh and that helped get my spirits up and helped me focus on the race. The first strength obstacle was a walk with a 50lb wreck bag up some small hills, followed by a monkey bar shimmy and then into the water. I could see one girl in front of me and I wanted to keep up with her so I trudged along the riverbank trying not to let my feet get caught in the sludge. The water was absolutely freezing (Tahoe was a warm bath compared to this water) but luckily there wasn't much wind. My hands however were like ice despite having gloves, and I knew that grip would be key. After jogging through the water and the woods I ended up back in the festival area for an onslaught of obstacles. I surprised myself by getting up an obstacle called The Destroyer, but stalled for 20 minutes at Dragon's Back. When I got to Dragon's Back there was another elite woman at the top who had psyched herself out of jumping, and almost instantly I told myself that I too didn't want to jump. The crowd was yelling encouragement and even the Race MC (Coach Pain) came up to give me a pep talk and helped work through my nerves. When I finally jumped all I could hear was about 50 people yelling congratulations at me. I then struggled getting over another high obstacle but didn't want to give up my band. The monkey bars (V shaped) killed my forearms and fingers but there was no way I was giving up. I had to tell myself "grip the bar" as my hands were so cold that I wanted to let go. I moved so slowly that one guy overtook me on my rungs, but there was no way in hell I was letting go. The one obstacle that got me was the Sternum Checker. Basically you jump and try to get over a high log, which sounds simple enough, but is hard when you have no grip. I stayed for an hour and tried seven times to get over it. I was getting my leg up but the numbness in my fingers meant I couldn't hold on to get my other leg over. After an hour I admitted defeat and they cut my wrist band. Then the tears started. The rest of the obstacles were tough and the terrain was very technical at times and although I tried to run as much as I could I struggled. The cold affected my breathing and even though I had a space blanket I wanted to push on. I kept pumping myself full of VFuel gels (Team Australia sponsor) and they helped with much needed energy and mental focus. My breaking point was at Mile 9 when I reached the tyrolean (rope) traverse. I couldn't get my feet on the platform at the end and the tears started again. I'd been going for almost 7 hours and I wanted to finish so badly. Then a stranger by the name of Amy grabbed my hand and literally dragged me up the next hill. All I heard was her voice telling me to keep going and so I pushed as much as I could and dug really deep. We got back to the festival area and the last few obstacles. The Team Australia guys were standing next to the slant wall yelling encouragement, and I gave every last ounce I had to try and get up the wall. After a few failed attempts the tears came hard and fast. I was sobbing as I had nothing left - physically and mentally I'd pushed myself to breaking point. Amy stepped up to the plate with Rin and they both got me up that damn wall after about five attempts. The tears kept coming and by the time I crossed the finish line 7 hours and 15 minutes after starting the race, I was sobbing. Everyone surrounded me with hugs and I took a few smiling photos before crying again. At the moment the medal was put around my neck I knew all the pain had been worth it. I've never faced such challenges ever before in my life and, until that day, I could never left everything I had out on course. I gave the race 110%, mentally and physically, and never let myself be defeated unless I tried my hardest to push through. A burpee penalty has nothing on the defeat I felt when failing obstacles repeatedly. I am proud of myself for pushing on through all the races and definitely have a lot of work to do mentally and physically to become the best I can be. This whirlwind adventure has taught me a lot about myself and was so much more fun than I ever could have imagined. There was plenty of laughter and tears and I would do it all over again in a second! My trip included running 6 OCRs totalling 90km, visiting 5 countries and 6 U.S. states, flying on 17 planes and being in 13 airports. To say I'm exhausted is a bit of an understatement, but I'm looking forward to planning the adventures for 2016!